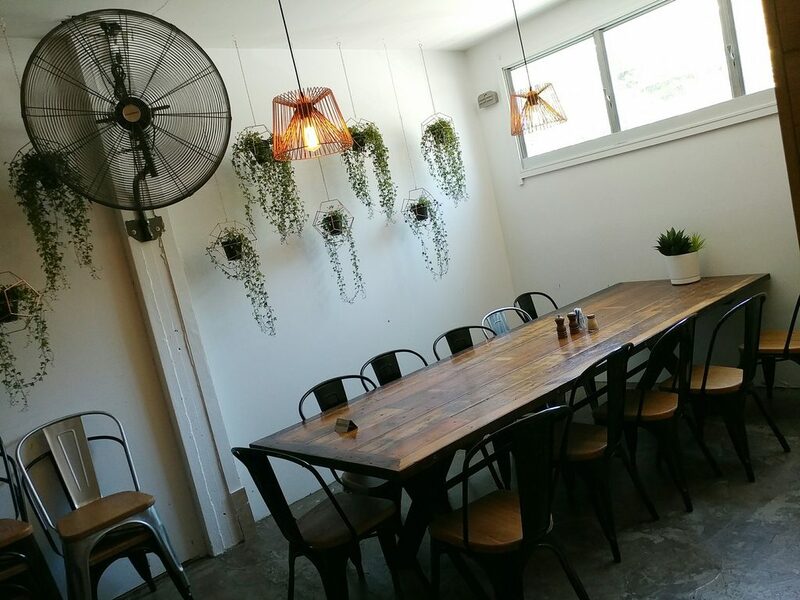 Todd and Pup has continued to stand as a brunch location in Brisbane’s southside (Moorooka) for some time now. Having enjoyed their food previously, we were happy to take up the invitation from the owner, Kate, to try their new summer menu. 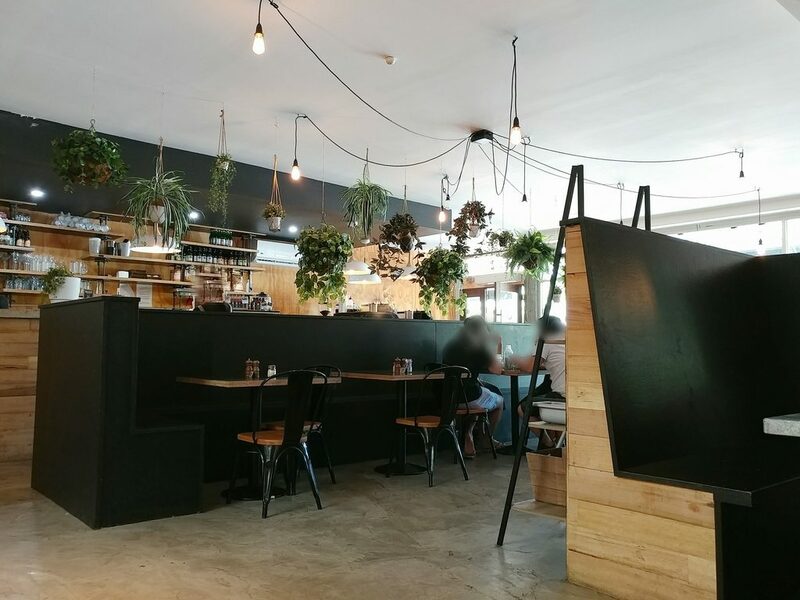 The interior remained the same as on our previous visit, with modern industrial styling of polished concrete floors, wooden tabletops, and pendant lights radiating out from a central point on the ceiling, softened by hanging greenery. A look at the interior area of Todd and Pup. 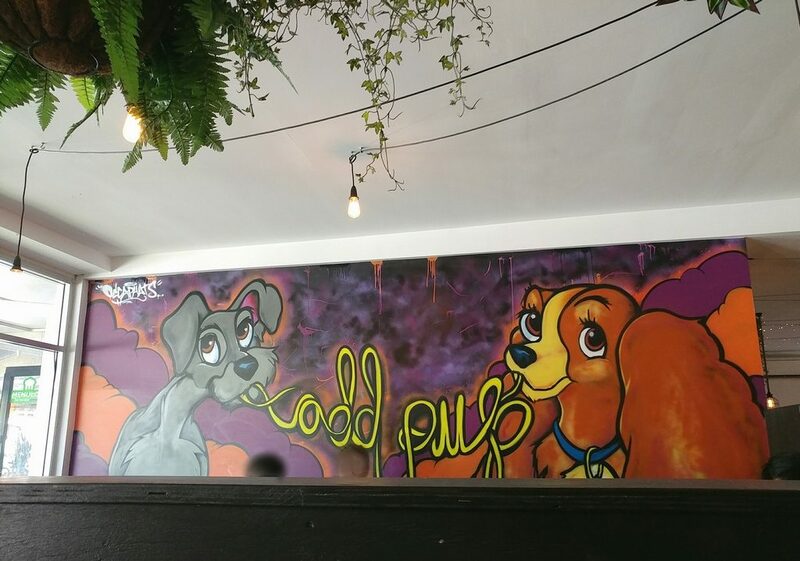 One eye-catching change we noted was a mural of the Lady and the Tramp taking up one wall, the iconic spaghetti they share spelling out the words “Todd” and “Pup”. We were showed around a table in the alcove area, where the air-conditioning was stronger (great on a hot day) and a bottle of water and glasses of ice were brought out shortly after. The menus were a similar format to previous, with food items on one side of a large, placemat-sized laminated sheet, and drink items on the other side. There were, of course, new items on the food menu (the reason for our visit), and there were new additions to the drink menu as well, including a number of cocktails, available at the venue from 10am (the currently used term is “day drinking”, is it not?). A table in the cooler section near the back that would fit a larger group. 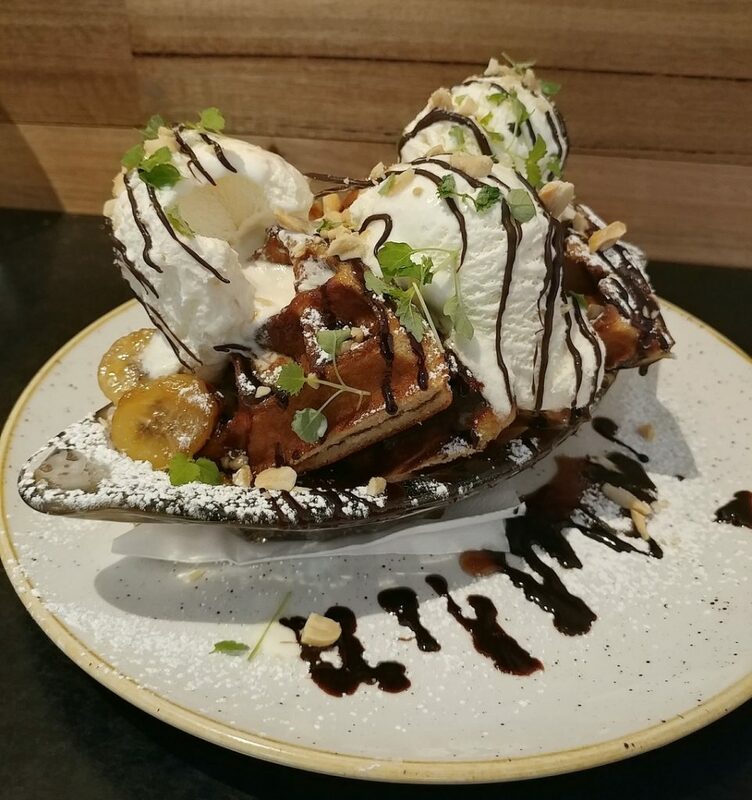 Though more typically preferring savoury over sweet for breakfast, the Choc-Banana Peanut Butter Waffle Sundae looked too tempting for us to pass up. 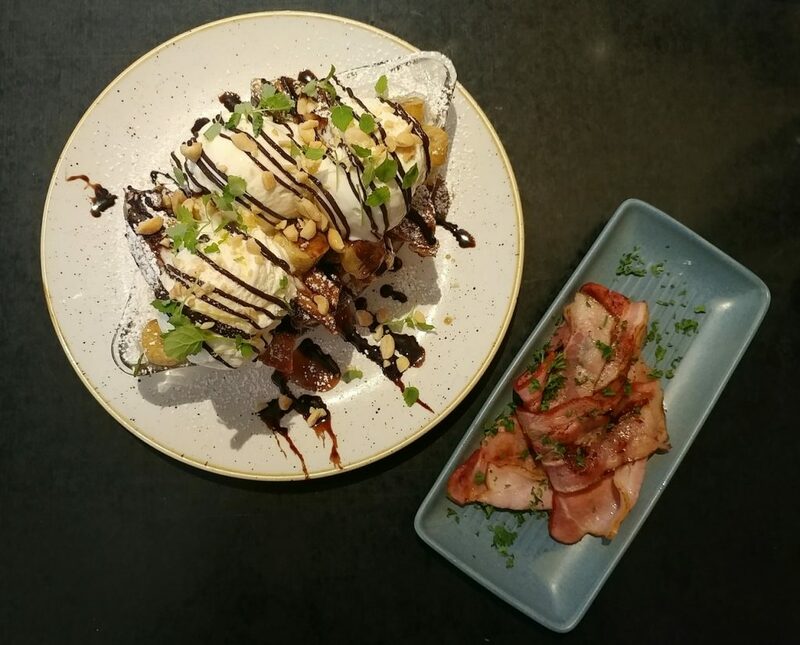 We had found the combination on their previous savoury mushroom dishes quite delicious, but decided to order the Festive Breakfast for our other dish, for something different. Our drinks arrived first. 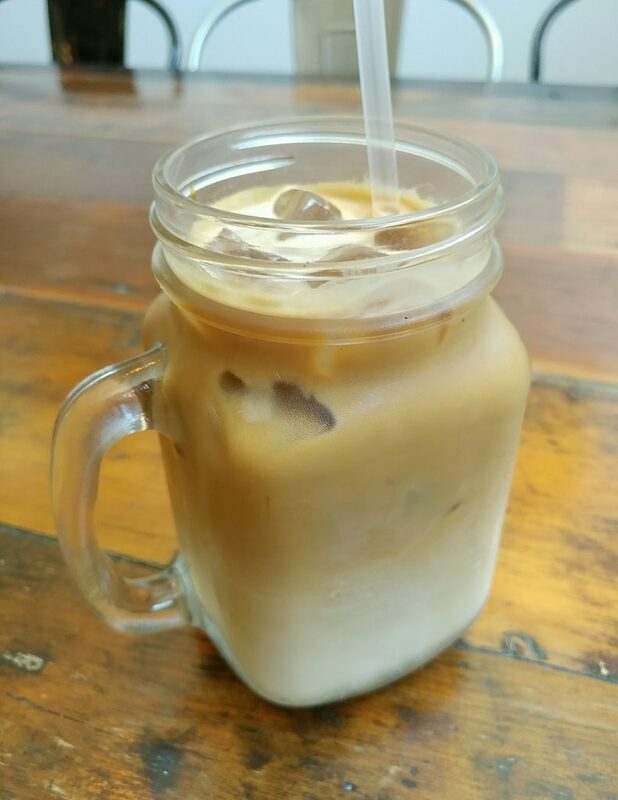 The iced latte was served in a jar-like glass, and had a pretty colour gradient to it. It was nicely chilled, and was an alright strength, but was a touch bitter in the finish. 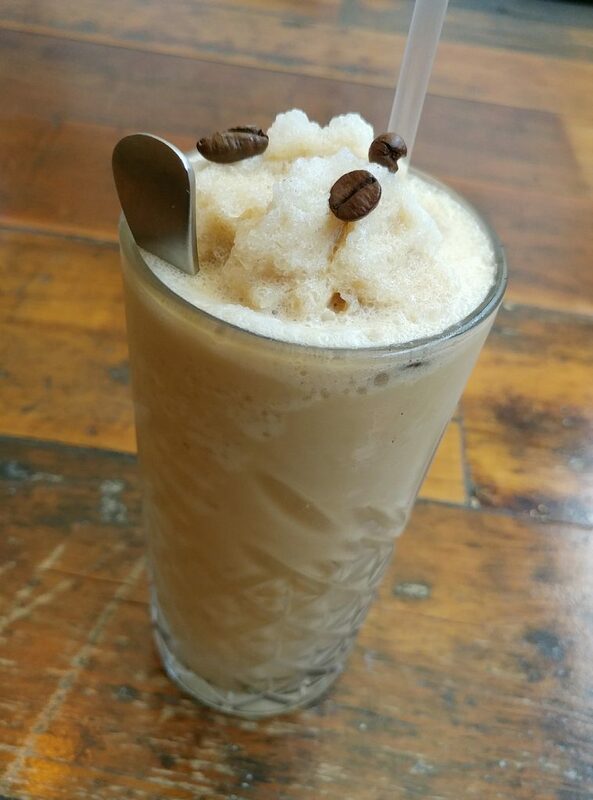 The coffee frappe came out in a tall glass, a generous serve, with the ground ice heaped, and topped with a few coffee beans for a visual hint of what it was. It was a slightly modified version of the usual, made on soy, with only a little ice cream, and not topped with cream. The regular version would likely be richer, with more rounded flavours. It did have faintly caramel notes to it. 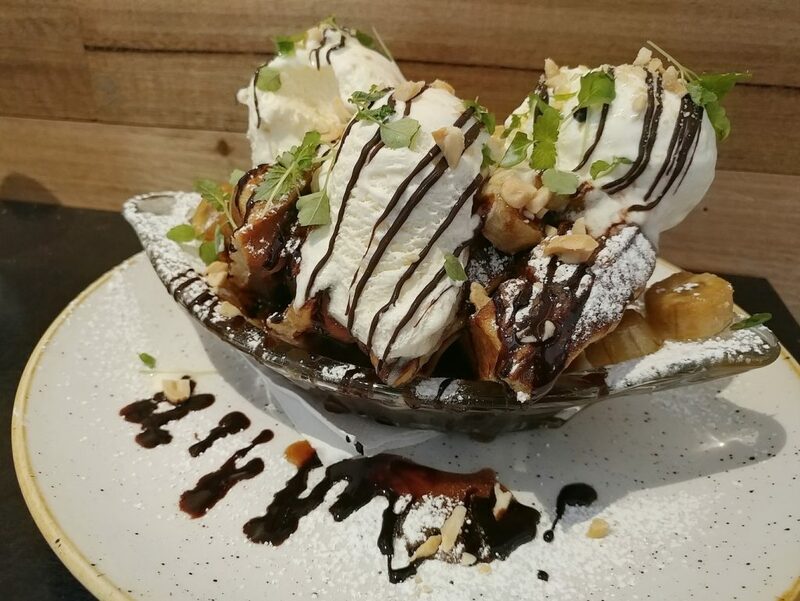 The Choc-Banana Peanut Butter Waffle Sundae was comprised of a peanut butter waffle, chocolate ganache, caramelised banana, peanuts, and vanilla ice cream. We also opted for the addition of bacon (if you’re going to indulge, you might as well do it properly). It was served in a boat-shaped glass dish, the traditional serving dish for a banana split. Wisely, there was a plate under it, to catch falling ingredients. The waffle quarters were lined up in the boat, then topped with the ice cream, which was then striped with chocolate sauce and sprinkled with chopped peanuts. The banana pieces were mostly at the bottom of the boat, but there were a couple on the ends as well. It was quite a sight to behold. The bacon was served on the side, on a separate dish. The ice cream became melty quite quickly due to the heat from the waffles, so one had to be quick with the photo-taking (we weren’t entirely successful). The plate was also very much needed to be able to take the waffle pieces out to dissect and eat. The waffle was well done, crunchy on the outside and fluffy on the inside. It also tasted distinctly like peanut butter, as promised. We also appreciated getting four quarters of waffles, rather than the meagre two quarters at Miss Jones. The caramelised banana slices were soft, and had their natural sweetness accentuated. The ice cream was creamy, but vanilla flavoured and not vanilla bean. With all the sweet components, we were glad that we had added the bacon on, as that provided needed contrasting saltiness. The slices of bacon were tender, and had been cooked well. The chopped peanuts added another crunch element to the dish. 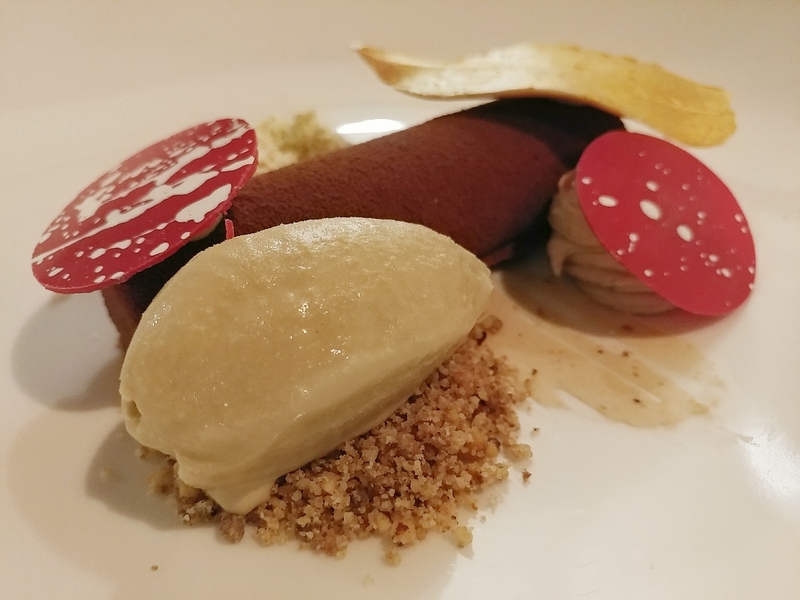 Overall, this dish would work well for those with a sweet tooth. 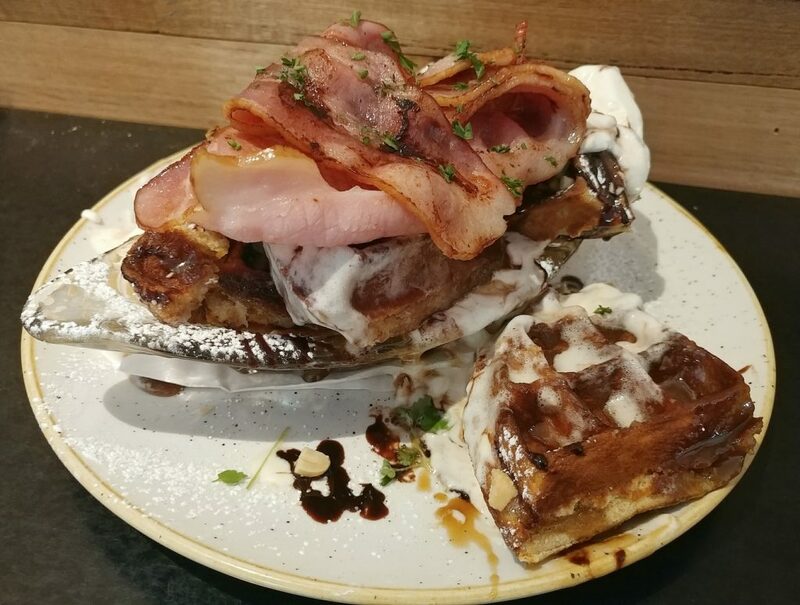 The Choc Banana Peanut Butter Waffle Sundae, with a side of bacon, seen from above. Peanut butter waffle, chocolate ganache, caramelised banana, chopped peanuts, and vanilla ice cream. The sundae boat closer up, ice cream already trying to jump ship. Putting some of the components together..and one of the waffle quarters taken out so it can be seen better. 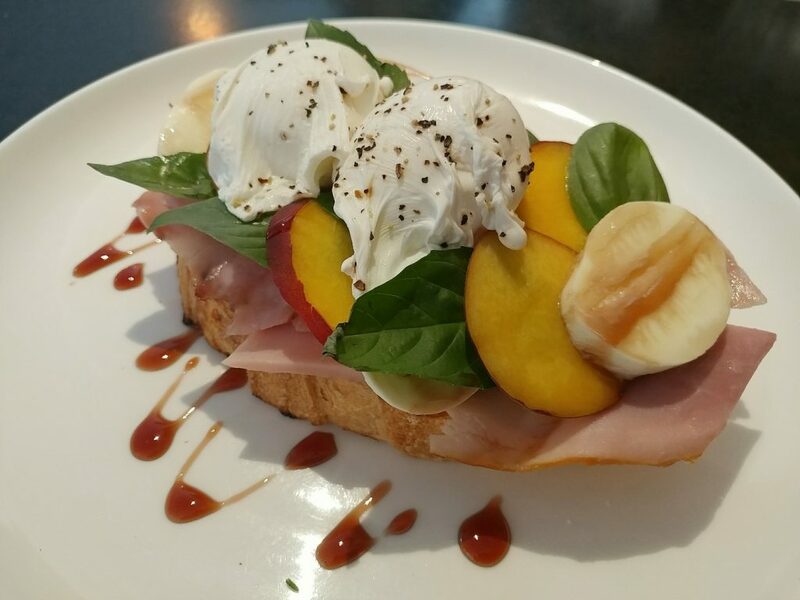 The Festive Breakfast had ham off the bone, basil, red wine glaze, peach, poached eggs, and bocconcini on sourdough. The plating seemed comparatively more restrained, neat, but colourful. The components certainly referenced the not-long-past Christmas. The ham came in thick slices, and was tender but had a meaty texture. 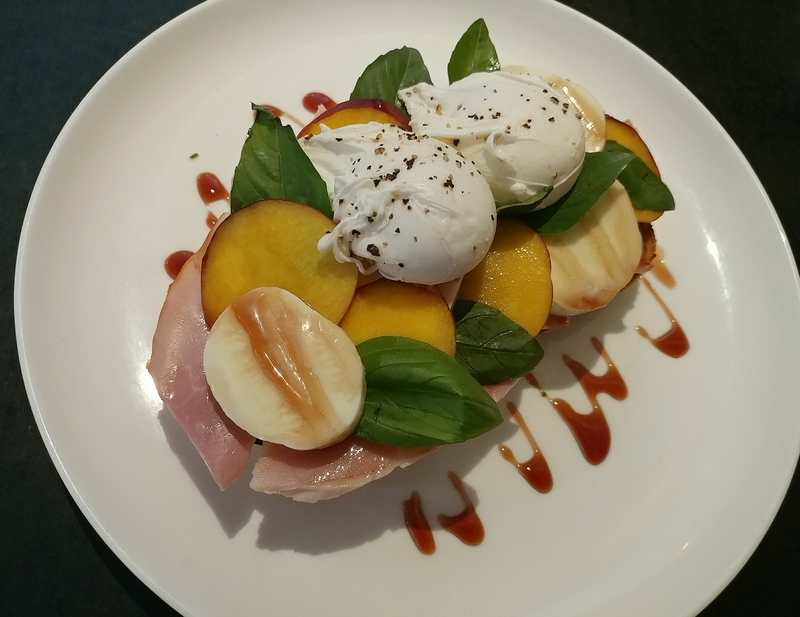 The slices of peach had a mild, fruity sweetness that set off the savoury ham well. The bocconcini slices added a little creaminess and a bit of density to the dish, but might have been nicer and melded better with the other components if they were melted in. The basil leaves added a fresh, aromatic note to the mouthfuls had with them. The poached eggs had appropriately gooey yolks. The thick cut sourdough at the base of the layered ingredients was crunchy on the outside and had a springy chew on the inside. The flavours of the components worked well together, but we did wish that there was more on the plate. The Festive Breakfast, seen from above. 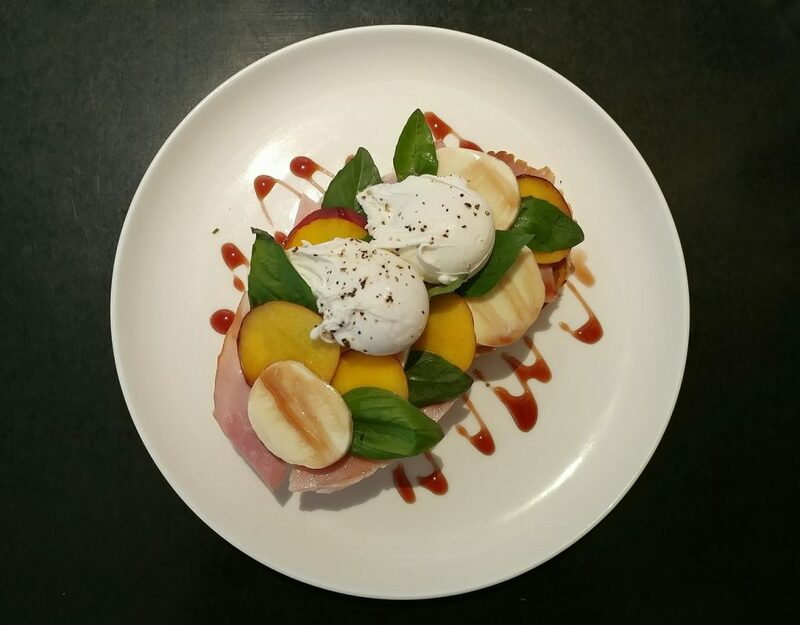 Ham off the bone, peach, red wine glaze, basil, poached eggs, and sourdough. The dish from another angle. Todd and Pup continues to challenge itself with seasonal new menu turnovers. They do put good flavours together, and with the range of options on the menu, even if you went with a group of picky eaters, any patron should be able to find something to interest them. Price point: Food items $13.50 to $24, for items more substantial than eggs on toast. $19 for each of our dishes, $5 for the added bacon.